What is a W-4 Used For? If you’re filling out a W-4, that means you’ve just started a new job! 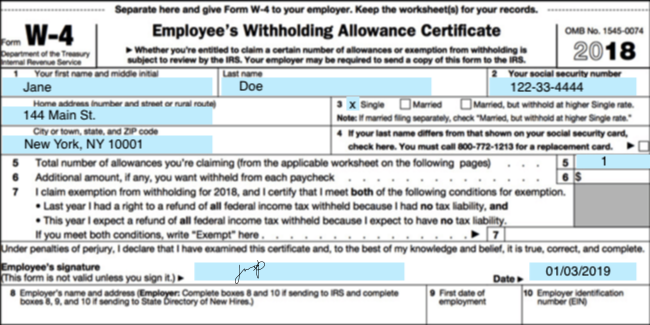 Each time you start a new job, you will be required to fill out a W-4 Form, or the “Employee’s Withholding Allowance Certificate.” The W-4 helps determines how much federal tax will be withheld from each of your paychecks and sent to the government. The government will usually collect the full amount of tax unless you qualify for any allowances. This is where the W-4 comes into play, as it helps you specify whether or not you qualify for any of them. There are a few big factors that determine how much your employer withholds from your paycheck. These include: the amount you earn, whether you are single or married, the number of withholding allowances you claim, and whether or not you request or need an additional amount withheld. It is important to fill out the W-4 correctly to avoid a big tax bill or even a fine for not having enough money being withheld. Want a free budget template? Sign up for a free personalized budget guide here. Not updating your W-4 when there are big changes to your life such as getting married, having a child, or other things like buying a house. Incorrectly calculating your allowances. Getting the right number is crucial because this determines how much of your paycheck is withheld, and you don’t want to end up under-withholding because you may get fined. Realizing a mistake in your allowances and not correcting them immediately. You should submit a new W-4 Form to your employer as soon as possible whenever you see mistakes so that they can withhold the right amount from your paychecks. Here’s how to complete the W-4 step-by-step. In section 1, fill out your full name and address. In section 2, provide your Social Security Number. In section 3, check your marital status, single or married. If you are married but legally separated, then check the single box. For the “married, but withhold at a higher Single rate,” you may want to check this option instead if your spouse also works and you don’t think that you won’t have enough tax withheld. Before you decide, you should read the Two-Earners/Multiple Jobs Worksheet so that you can make the right choice. Here is what the form looks like for reference. Section 4 doesn’t apply unless you’ve recently gotten married and changed your name but have yet to receive your new Social Security Card. If so, you’ll have to call for a replacement as soon as possible before you can submit your W-4 to your employer. Section 5 asks for the number of allowances you are claiming. 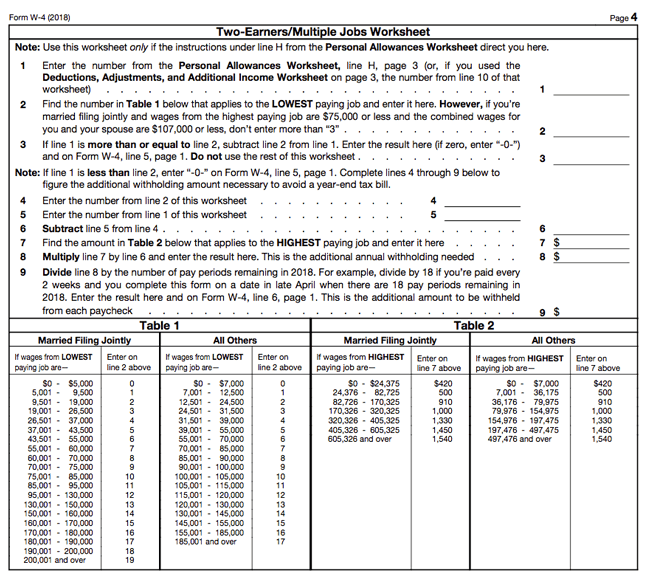 To calculate this, use page 3 of the W-4 packet, called the Personal Allowances Worksheet. A. Claim one allowance if you are an independent, which usually is the case for most adults. However, if your parents claim you as a dependent, you do not claim an allowance here. B. Claim one if you are married filing jointly. C. Or if you are not married filing jointly, you can claim an allowance for head of household. The IRS considers a head of household as someone who is unmarried and pays more than 50% of the living costs for themselves and their dependents. D. You can claim another allowance if you are either single or married but filing separately and have one job, married filing jointly with one job while your spouse does not work, or you or your spouse’s wages from a second job are less than $1,500. Essentially, you can claim an allowance if your household only has one main source of income. E. For this part, you can claim an allowance for each eligible children, based on your income and the number of children you have. F. Next, you can claim another allowance for other dependents you will claim on your tax return. Other dependents means a qualifying child or qualifying relative who lives with you and you support financially. However, there is an income limitation here. G. If you have other credits, check Worksheets 1-6 in IRS Publication 505 to see if you are eligible for additional allowances. Here is the worksheet so you can see if any of these apply to you. H. Sum all your allowances and write the total here. Transfer this total to line 5 of the W-4 Form, and keep the allowances worksheet for your own record. 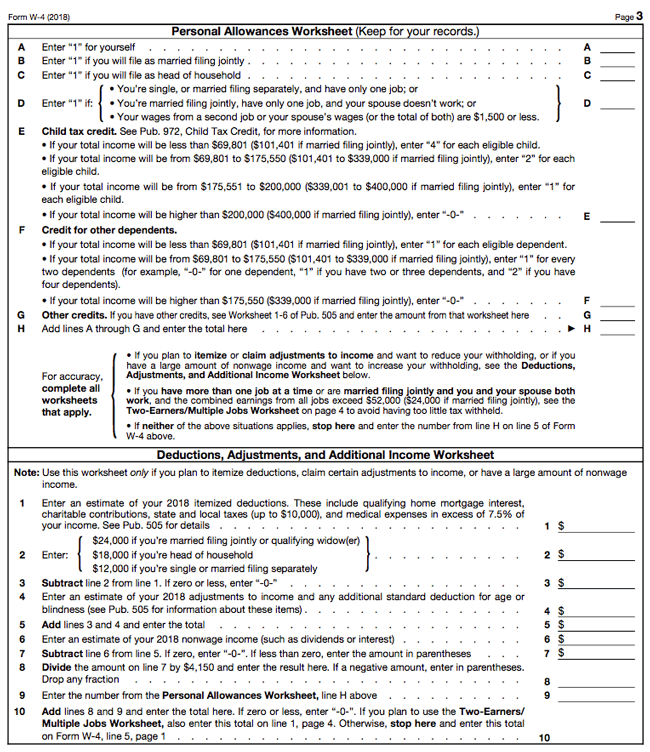 In box 6, the IRS wants to know if you want an additional amount withheld from your paycheck. If you have a significant amount of income recorded on the 1099 Form (self-employment income, dividends, or interest), you may need to tell your employer to withhold additional money since there is no income tax withheld from these other sources of income. In box 7, write exempt if you are legally exempt from withholdings because you had no tax liability last year and expect the same for this year. This usually applies if you earn less than $12,000 if you are simple, or $24,000 as a married couple. Otherwise, you should leave this blank. Here is a chart to determine whether or not you are legally exempt. Sign and date the form. Finally, separate the W-4 Form and give it to your employer. You should keep the top portion for your own records. 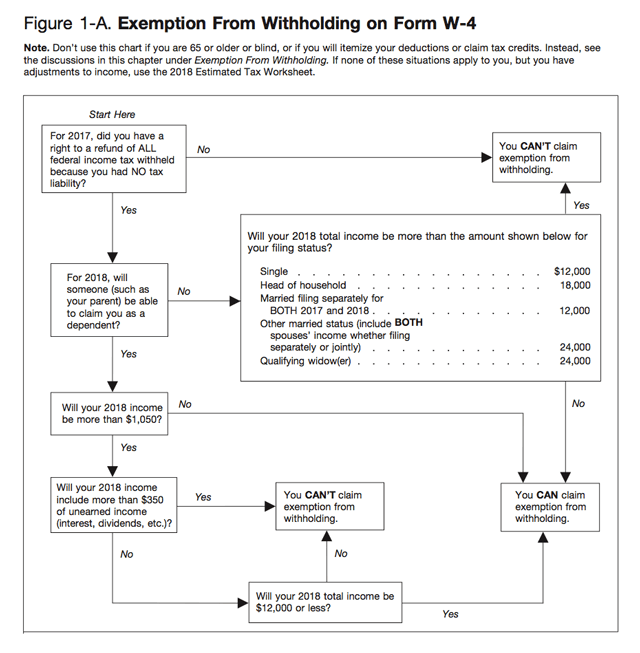 What does a filled W-4 Form look like? Here is an example of a completed W-4 if you are an independent single with one job. Ideally, most people will claim one allowance. Note that if you’re single and have one job you can typically claim two allowances as well, but many stick with one allowance to increase their tax return at the end of the year. How do I change the amount of tax withheld on my paycheck? 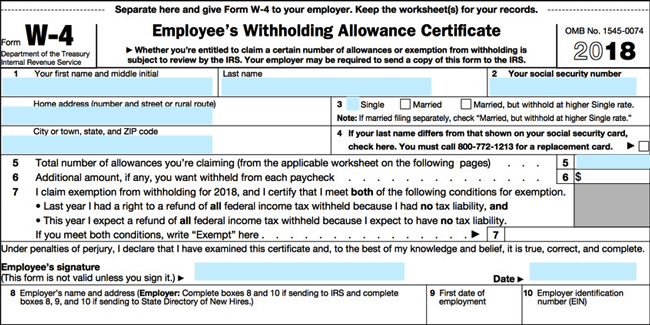 To change the amount withheld, fill out a new W-4 Form and give it to your employer. You can do this whenever you believe that you should have more or less tax withheld. Are some individual taxpayers at risk for being under-withheld? Some people might have more complicated tax situations, and may face the risk of being underwithheld. Some situations include having two or more jobs, people who had itemized deductions in the past, or dependents that are over age 17. The IRS encourages everyone to check their withholdings, and you can use the IRS Withholding Calculator to help you determine this. Are many people under-withheld on their taxes? Most employees are actually overwithheld on their taxes. Generally, more than seven in ten taxpayers are overwithheld, meaning that they will get a refund when they file their tax return. 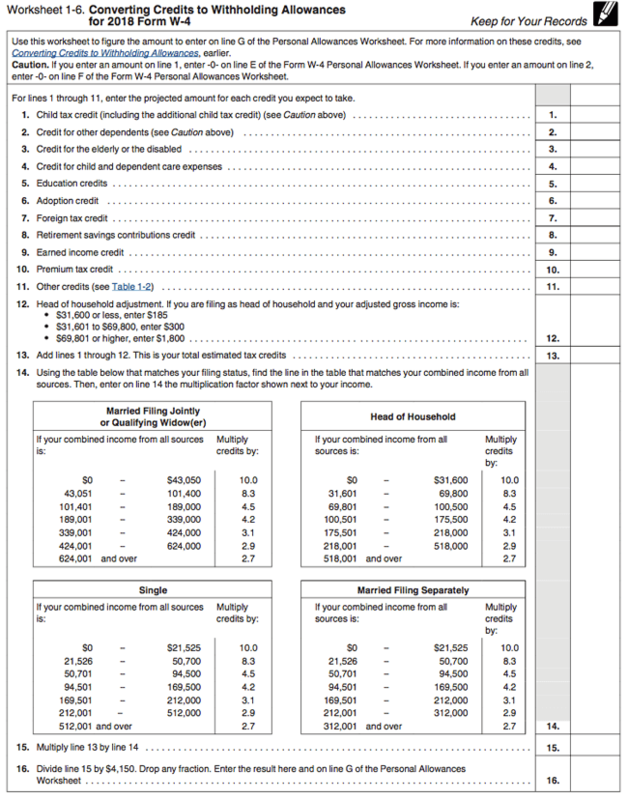 If you got a tax refund the previous year, you may want to use the WIthholding Calculator to see how you can reduce your withholdings for more money in your paychecks now. Are there penalties for under-witholding? An estimated tax penalty will be applied if a taxpayer paid too little of their taxes during the total year. This penalty is calculated based on the IRS interest rate on unpaid tax. Generally, to avoid this penalty taxpayers must pay at least 90 percent of their total tax liability.